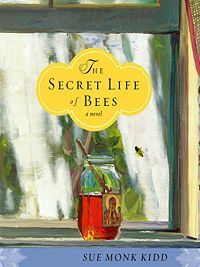 The Secret Life of Bees explores the journey of Lily Owens' life told through parallels of the life of bees. Time is set in 1964, South Carolina. Lily is haunted by a blurring wisp of a memory of the afternoon her mother was killed. This leaves Lily to grasp for any memory she can think of about her mother. Her brash father is no help to her and is a continuous source of friction. Rosaleen cares for Lily, with her limited resources, and they become bonded. Through a serious of troubling events, Lily and Rosaleen escape their life as they have known it and find comfort in a town called Tiburon. A trio of sisters, takes them in and they are introduced to an exciting and magnificent new world of beekeeping. Each chapter has a quote about bees at its beginning which is what drew me into the book and kept my curiosity in order to finish it. Most likely, this is because I have a personal interest in bees since as a young girl I remember helping my dad harvest the honey from his beehives. I could relate to the processes of beekeeping sprinkled throughout the story. As Lily remembers; "Right now it's enough to say that despite everything that happened that summer, I remain tender toward the bees." I enjoyed the characters which are charming, endearing and fun to read and imagine. There are times that this book seemed unrealistic but I didn't feel the need to take it so seriously. After all, It is about an 'escape' for Lily and Rosaleen which leads to a fantasy-like quality for the book. I think if my life seemed as conflicted and tragic as Lily's or Rosaleen's, enough to actually escape it, I would exaggerate or fantasize for something better. Although, this book has some poignant messages that it tries to convey, I think its captivation lies in the 'escape.' I would recommend that it is read in that same way. "All the mothers. I have more mothers than any eight girls off the street. They are the moons shining over me." I am planning on reading "The Mermaid Chair" by this author next year. I haven't decided yet if I should read this. I'm a little leery about it, about whether I'd enjoy it or not. I have both Secret Life of Bees and Mermaid Chair on my shelf - I will probably read them both in 2009.